Originally posted on A Buckeye Girl Reads As You Wish is a totally sweet Paranormal Romance. It's book two in the Time of Transition series, but it can be read as a stand alone book-but like all books in a series, it helps to read the books in order. :) I just adored this book. It had all the right ingredients-romance, magic, strong hero and heroine and a lovable secondary cast of characters. Reggie Scott is born into a magical family, but has no magical abilities and instead is happy running her bakery. Then out of the blue, she discovers that she's a fairy godmother. As soon as she is given the news, by the old fairy godmothers, they take off for parts unknown because they are wanted by the Arcani council because of actions that take place in book one. Reggie's left on her own to figure out what it means to be a fairy godmother...she does have a little help from the mysterious Jonathon Bastion, a guy who is really rich from wand making and Nate, a customer from the baker, and of course her family. I think one of the best things about this book was how once Reggie discovered she had magic, her friends, family and the place she worked didn't disappear from the storyline. In so many books, the heroine tries to do everything by herself, and her old way of life just disappears. Not so in this book-they all work to help Reggie out, and it was just refreshing to see. Along the way of figuring out what powers she actually has a Fairy Godmother, Reggie discovers that the council wants her to swear an oath that she isn't against them because the last new fairy godmother Kristen from book one, tried to warn them that someone was trying to take them over, and they didn't believe her and declared her and the former Fairy Godmothers public enemy number one. Reggie doesn't like how the council is operating, and wants to figure out for herself if Kristen and the Fairy Godmothers really are as bad as the council says they are. Nate and Jonathon both win a place in Reggie's heart as they work with her to figure out if the councils on the up and up. They quickly figure out there is more to the story, and help Reggie to clear Kristen and the former Fairy Godmothers name. The council though, keeps trying to pressure Reggie into pledging her loyalty to them, and she has to keep escaping them...I love how there are a few bad guys in this book, including a familiar evil guy from the first book. The love story between Reggie and Jonathon is just so well, sweet. I loved how there was actually a romance in this story, and they weren't fighting the whole book. There was some fighting their feelings, but I loved watching them realize how important they were to each other and that there is more to someone then meets the eye. I liked how the whole time you knew something was up with Jonathon-he became friends with Reggie for his own selfish reasons, but it took me awhile to figure out what the reasons were and then I was like "duh" I should've known that. :) Jonathon is one of the few "nice guy" heroes that I actually really liked. Reggie did have some moments that made me go "Oh, Reggie, really?" but they were few and far between. 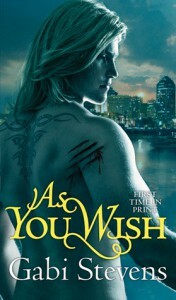 While I liked book one in the series, The Wish List, I just adored As You Wish and can't wait for the next book in this series.